LITA: We’ve seen your formal bios but can you tell us a little more about you? Kate: If I didn’t work as a user researcher, I would be a professional backgammon player or cake decorator (I am a magician with fondant!). Or both. Robert: In a past life I was a professional actor. If you pay really really close attention (like, don’t blink), you might spot me in a few episodes of Friday Night Lights or Prison Break. LITA: User Testing is a big area. Who is your target audience for this workshop? Presenters: This is a perfect workshop for people who want to learn user testing in a supportive environment. We will teach people how to test their websites in the real world – we understand that time and other resources are limited. This is for anyone who wants to know what it’s like for patrons to try accessing their library’s resources through their website. LITA: How much experience with UX do attendees need to succeed in the workshop? LITA: If your workshop was a character from the Marvel or Harry Potter universe, which would it be, and why? Kate: Having just read the Harry Potter series with my two kids, I can say that our workshop will inspire like Dumbledore, give you a chuckle like those naughty Weasley twins, teach you like the astute Minerva McGonagle would, and leave you smiling with satisfaction just like the brilliant Hermione Grainger. Deirdre: Either Hermione or Jean Grey (pre-Phoenix, obviously). In either case, someone others turn to for advice and guidance, but who truly guide rather than doing it for you. Robert: I’m gonna say Mystique. Mystique can literally put herself in someone else’s shoes (human or Mutant). When we conduct usability testing, we’re directly observing what it’s like to be in the user’s shoes and we’re seeing things from their perspective. LITA: Name one concrete thing your attendees will be able to take back to their libraries after participating in your workshop. Kate: The knowledge about how to conduct a user test on their library site, a coupon for a free test from usertesting.com, and support and encouragement from a team of experienced researchers. Deirdre: The skills to plan, recruit for and execute small-sample usability tests. The ability to communicate the findings for those tests in a way that will advocate for their users. Robert: The ability to validate your ideas about your website with direct, reliable user feedback. Whenever you think, “This might work, but would it make sense to our users?” You’ll have the skills and tools to go find out. LITA: What kind of gadgets/software do your attendees need to bring? LITA: Respond to this scenario: You’re stuck on a desert island. A box washes ashore. As you pry off the lid and peer inside, you begin to dance and sing, totally euphoric. What’s in the box? Kate: I’m assuming my family is on the island with me, and in that case – I want that box to contain Hershey’s hugs, the white chocolate kisses with milk chocolate swirls. I’m obsessed! Robert: A gallon of Coppertone Oil Free Faces SPF 50+ Sunscreen. I’m sorry but I’m fair skinned with a ton of freckles and a desert island scenario just screams melanoma to me. Thank you to Kate, Deirdre, and Robert for giving us this interview! We’re looking forward to their UX Workshop at Midwinter in Chicago. We’ll hear from our other workshop presenters in the coming weeks! More information about Midwinter Workshops. As in the example below. If you do so, then when you get to the workshops choosing page the discount prices, of $235, are automatically displayed and entered. The discounted total will be reflected in the Balance Due line on the payment page. 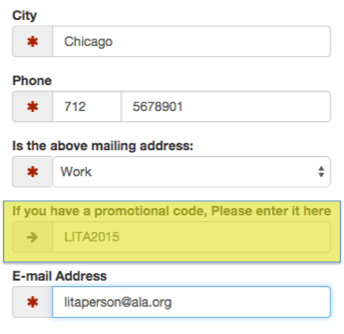 Please contact the LITA Office if you have any registration questions. 2015, ALA Midwinter Meetings, General information 2015, ala, Chicago, Institute, Institutes, January, Midwinter, Workshop, Workshops. permalink.